Getting Un-Stuck from your Rut! 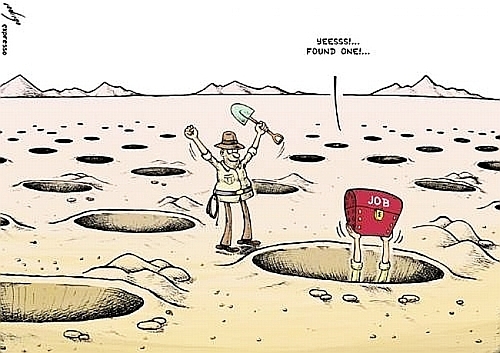 Did you ever feel like your job-search is stuck in a rut? Are you doing the same things over and over, and expecting different results? Do you feel as though you are doing all the “right things” but still getting nowhere? Are you wondering why your carefully planned, well-thought-out plan is not producing results (i.e. a job!?) Sometimes you need to step back, re-assess what you are doing and consider alternative strategies. Sometimes you need to get out of your “comfort zone” and try new things that may seem scary at first, but ultimately may move you forward. Here are a few suggestions for things to do to get unstuck from a job-seeking rut. These are ideas that may just shake up your routine a little, get you moving in a different direction, get you talking to new people with new ideas, or simply re-energize you. You already have a target list of companies that is your road-map for networking your way to a job, right? NO??? If not, Do Not Pass GO, and proceed directly to “How to Network: A Step-By-Step Guide for Job Searching” for instructions on how to create a target list and use it to conduct an effective networking campaign. Assuming you do already have such a list, and you’ve been working off of it for a while, this may be a good time to re-evaluate that list and consider expanding it to include new companies that you didn’t consider before. Go back to square one and re-create your list with wider parameters so that you have fresh new places to target. Having new targets can re-energize a stale search plan. The internet is a wonderful tool for job-seekers. It can also be a huge distraction and waster of time. Make sure you are not spending your days in front of a screen without having actual meaningful conversations with people that are part of your job-search plan. Answering online job postings is one of the least effective ways to find a job. Limit the amount of time you spend doing that to around 10%. Sending emails to targeted people is often a good first step in the right direction … but in the end, direct live communication with actual people is the ONLY way business gets done, decisions get made, and people get hired. Overcome your fear, stop worrying about rejection, step outside of your comfort zone and PICK UP THE PHONE! Better yet, set up appointments with people connected to your target list, get out of the house and MEET WITH PEOPLE! Make yourself a list of each and every significant person you’ve contacted about your search since you began the process. If you’ve been searching for a while now, there are probably people on that list that you’ve let slide and not talked with in a long time. Go back and re-visit with those people now. Let them know what you’ve been doing since you last spoke with them – who you’ve met with, what companies you’ve applied to or interviewed with, what decision-makers you’ve made contact with, and who you are still hoping to connect with. If you haven’t already done so, send or show those people your target list and ask if they know anyone in your niche at those companies. Then, keep those re-visited contacts on an organized list of people to stay in regular touch with. Create follow-up reminders for yourself, using a calendar. Don’t let your contacts go stale. It’s worth noting here that, despite the “Definition of Insanity” quote, certain job-seeking activities actually do have to be done over and over again to yield positive results. Networking is the prime example of that. Done properly, networking is a complicated process which must be viewed as a long-term strategy – and as such, it can also be both repetitive and very time consuming. Patience and consistency are the keys. While it may not produce quick results, it will position you well for long-term success. So don’t let the job-searching saga get you down. Don’t give in to negativity. If you find yourself feeling stuck … shake things up by trying some of these new ideas. Break out of your rut and dig yourself out of the hole you’ve fallen in. You never know – that illusive treasure you are seeking might just be closer than you think! Even though this is probably totally useless trivia information, if you just can’t stand not knowing … the answer to who actually authored “The Definition of Insanity” quoted at the top of this article is here: THE ANSWER. Entry filed under: Advice for Job Seekers. Tags: job-seekers, networking, time-management. There’s some great advice here. I agree that finding a job is a job in itself, and should be treated as such. It’s hard to keep up the motivation in the face of repeated rejection, but you’re right Michael, the key is to be creative, seek out new ideas and take advantage of the mass of free careers and job hunting advice freely available on the net. Well written, great graphics, yes it is time to get out there. I have shared this on my Facebook page. Thank you for some great advice! I really enjoyed reading this. I have been out of work for a year now and definitely feel like I am in a rut. I am going to take your advice and shake things up a bit. Keep them coming! I would like to read more of your words of wisdom! I just wanted to say that I really enjoy your articles. I have learned a lot. I have been very fortunate to have encountered a friend that is an HR employee for a company here in the Cleveland market. I forwarded your publication blog on to her and she totally agreed with everything you had mentioned. Keep up the the good work. More pearls of wisdom. Thank you, Michael. Working your network to set up meaningful face-to-face meetings is the #1 most effective job search process. Another well written and informative piece! As always, I have printed it out and read it over several times. My favorite take away is to remember to pick up the phone and to make the calls. It is easy to get caught up in simply surfing the web all day. Great intel, thanks for taking the time to share your knowledge. I find myself in a career transition and your thoughts definitely help sharpen my focus. Franklin or Einstein could have written the definition of insanity. I know it as an AA program saying. Whoever wrote it was on to something. Loosing a job is hard. It isn’t only the loss of income. It isn’t only a loss of part of our identity. There is a strong social element. I work with people i care about. Even though I only see them at work, I see these people more than I do most in my life. I would mourn not seeing my work friends. There is an unpaid job benefit. That quoted is attributed to Einstein, but he is not documented as its source. But it’s a great intro to some valuable advice. Probably the three hardest elements of a job search are organizing your time, battling feelings of isolation and keeping up your enthusiasm as your efforts are constantly rejected or ignored. Check the link at the bottom of this article (where is says: “The Answer”) for the true documented author of the quote. It’s not Einstein! And, I agree 100% with your comments. All 3 of the elements you mentioned are topics of my other blog articles! I found your tips on job hunting, etc. very useful. Like many these days I find myself stuck in a rut looking for jobs since July 2009. I want to extend my appreciation for your hard work with your site to help people like myself. I would like to learn more about new tips or articles you may add.